Today was Day #1 of Chocolate and Flower Theme Week -- in which I had some fun with flourless, flours, and flowers. 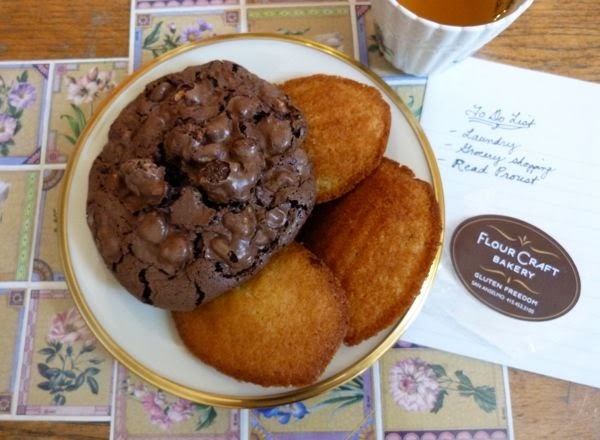 Flour Craft Bakery (San Anselmo, CA) makes gluten-free baked goods, and I picked up some of their fresh-baked Flourless Chocolate Walnut Fudgies (cookies) and their gluten-free Lemon and Lavender madeleines at the Marin Civic Center Farmers Market recently. (I'm saving the Salted Butter Chocolate Chip cookies for next week.) 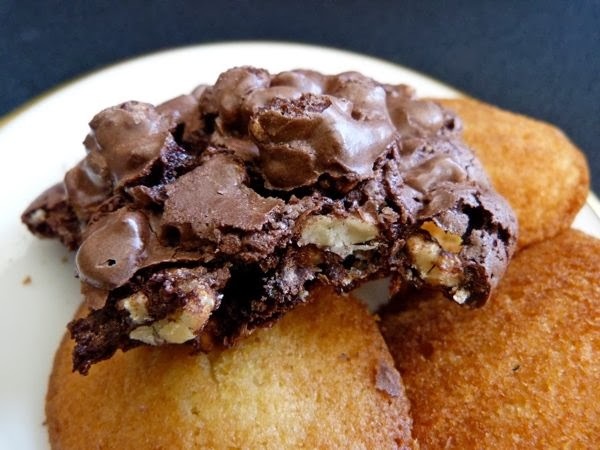 These treats made a great cookie plate with tea. The Flourless Fudgies were especially good -- a fudgier, richer version of a chocolate meringue cookie. Fresh-tasting, baked walnut pieces provided delicious nutty taste and texture and helped balance the sweetness. The Lemon and Lavender madeleines were subtlely flavored and fun. It was the first time I'd seen gluten-free versions of these traditional shell-shaped, not-quite cakes not-quite cookies. They were wonderful with Lemon and Earl Grey Lavender teas (and I suspect they would make great companions with any tea).